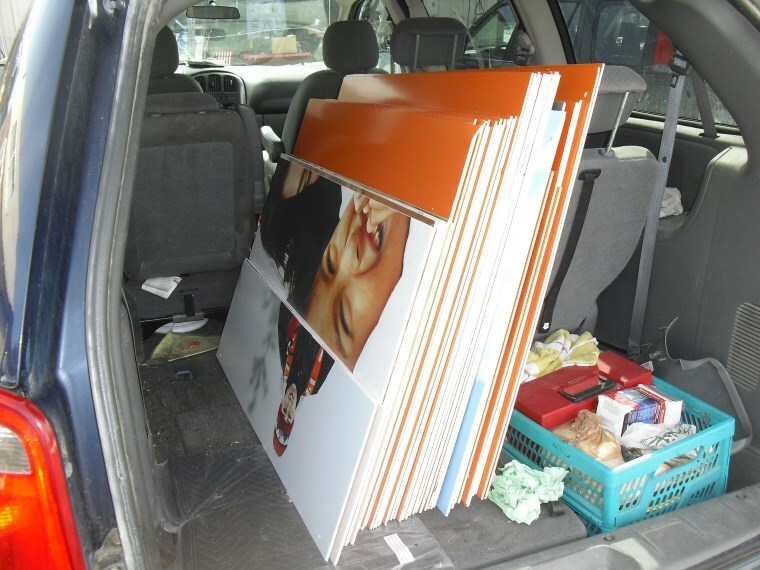 Rather than the normal paper-skinned foamboard (which I'll get the next time I'm in Dollar Tree, the nearest is 100 miles), at our local closing-forever Shopko I bought a bunch of plastic-skinned foamboard, images printed on one side and glossy orange on the other. I am now testing the FT foamboard building techniques to see which are usable as-is and which need to be modified. The first thing I noticed was when I cut half way through and bent it, the uncut sheeting cracked (whether scored or not). This raised some issues regarding the thoroughly demonstrated building techniques. 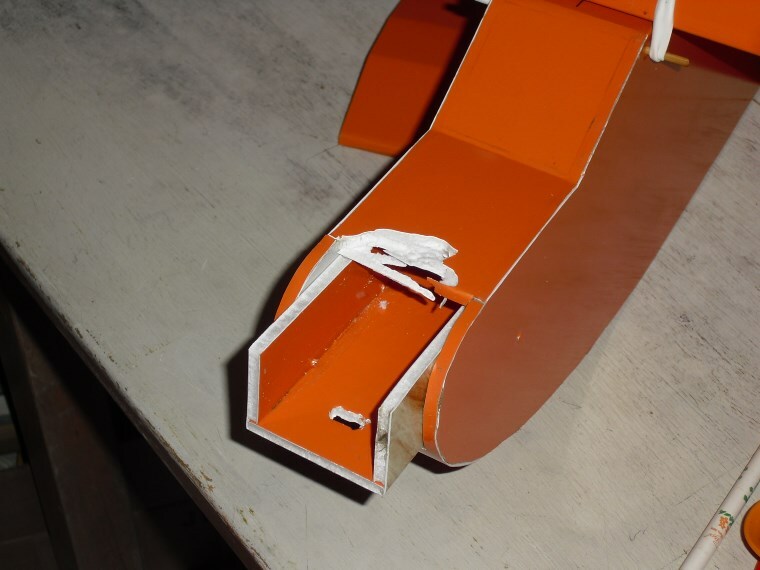 Paper (sheeting) hinges are out, as this sheeting material is more like styrene (whether it actually is or not). I'll have to do it as tape hinges or glue in actual hinges. Test bending (A,B and C) folds is out, as this willl crack at the fold. Peeling one side of sheeting... I'm not sure yet but it looks like it'll be difficult. 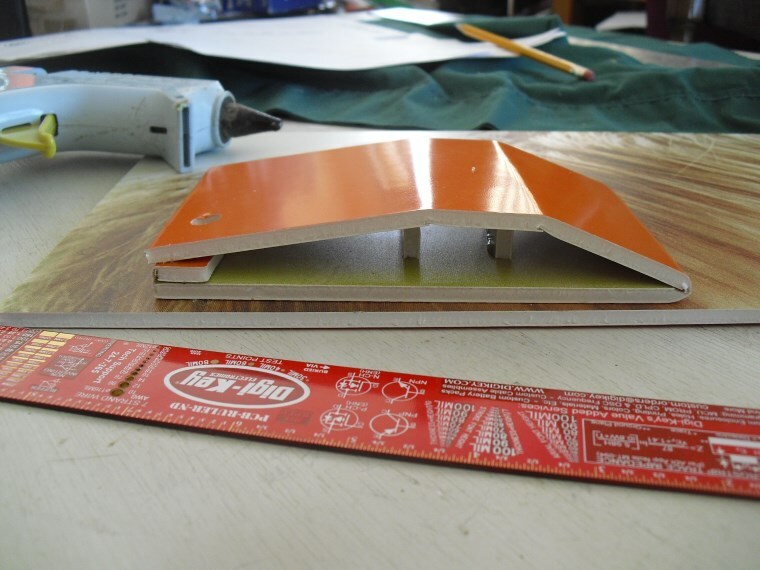 Gluing I found will help against the cracking bends, the heat from the glue softens the sheeting until it cools. Where some planes have a spar made by half-cutting the foam and gluing it folded back (there's no fold name for this like for the A, B & C? ), I'll have to see if a bead of glue on the fold will soften it enough to fold tight or just let it crack and the glue holds it alone. 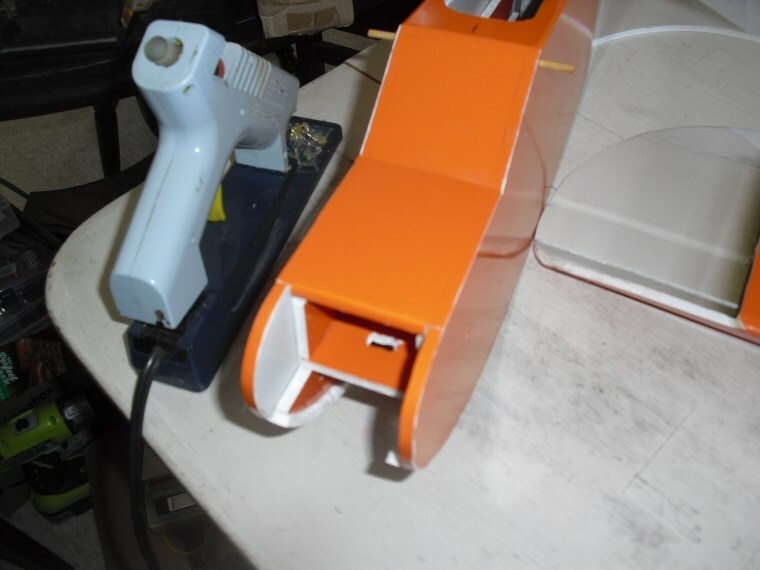 I haven't tested the bonds yet but when I do get around to actually building planes, if I am gluing the shiny side, I'll scuff it up first with sandpaper, like roughing up the side of servos to glue them. 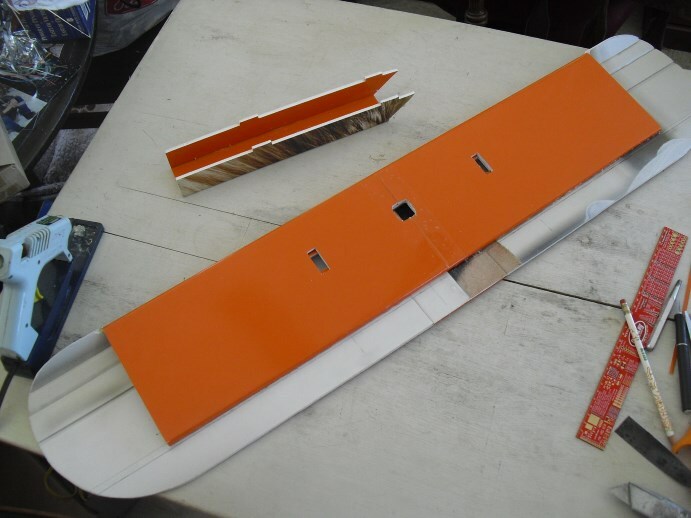 Here I made up a wing segment from the Simple Cub plans to test these methods (not the hinges yet). Is the trailing edge really that thick, or did I misread the plans? Having no paper, I think this board should work nicely for anything that might see use on water (floats, sea planes, actual boats, etc.) or fly in rainy weather (nobody ever does that, do they? ). The glossy side should also slide nicely on snow. Looks interesting, any idea who makes it. BTW, my Dollar General carries Adams foam board. Wal-Mart has Ross foam board. You'll also have to pay attention to the weight. I bought some Wal-Mart Foam board and it's twice as heavy as the Adams rediboard. Chuck glide it first to make sure of the chances of it flying well. Of course you can add more power but that adds more weight. Ask someone who has built the cub how much theirs weighed and compare them. 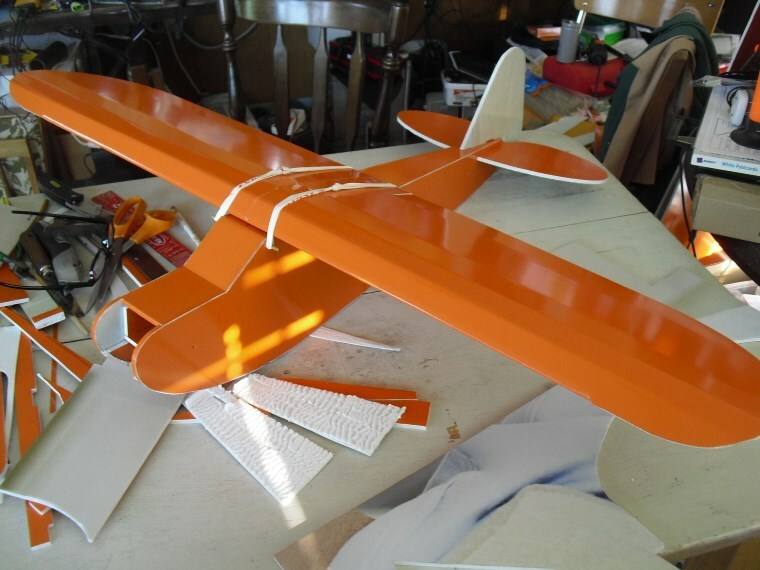 Yes, the top is intentionally cut short because I knew ailerons would have to be added with some other hinge material. This was just a short segment of wing for initial testing. Result of part of that testing, the C fold has a crack half way along one bend from a little initial test bending. The hot glue softened the rest to bend easier without breaking and subsequently held everything together. Here's my stash, waiting to find a more permanent place to await use. It might last me a little while. Got a start on the Simple Cub using this board. Though I haven't built with the normal foamboard yet, I can tell this is stiffer to work with even with the hot glue softening the sheeting. Because of this I added one more score line to the leading edge. I maybe should have cut a wider V for the LE. This stiffness lost me 1/4" of aileron but this shouldn't be much problem. I have hinges to glue in but I'll wait a while before finishing the aileron cuts. I'm still waiting for the power pack (back-ordered just a couple days ago) and motor mounts to arrive. Once the plane is (nearly) finished, I have a twist to add for those who haven't seen me mention it in another thread. 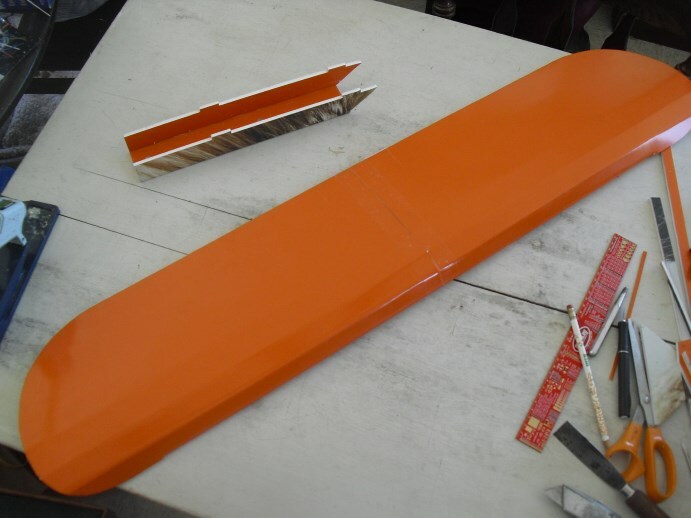 Don't look like your missing any aileron from these pics. Looking real good! Looks good to me. How does the weight compare to the regular Adams board? Elmer's board from Walmart is about the same thickness as the Adams stuff, but is roughly twice as heavy. It has it's uses in certain applications, as it is stronger. For example, I use it in my Storch fuselage which sees a whole lot of takeoffs and landings at gross weight due to my camera gear. I've found that it doesn't wrinkle where the gear connects to the fuse. I'm curious how your material compares in weight and structural integrity. 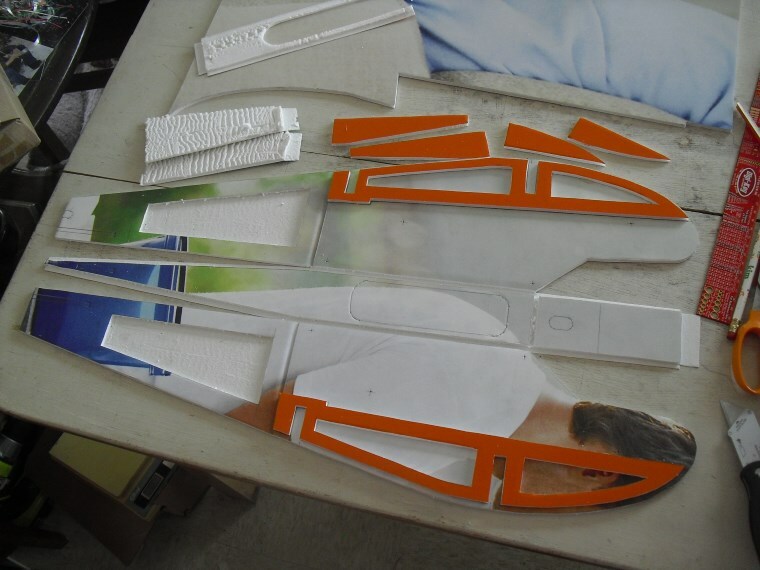 See the wingtip, there's a double line for the aileron, one transferred from the plans and the other drawn after gluing. I haven't cut any board down to 20x30 to make comparison. 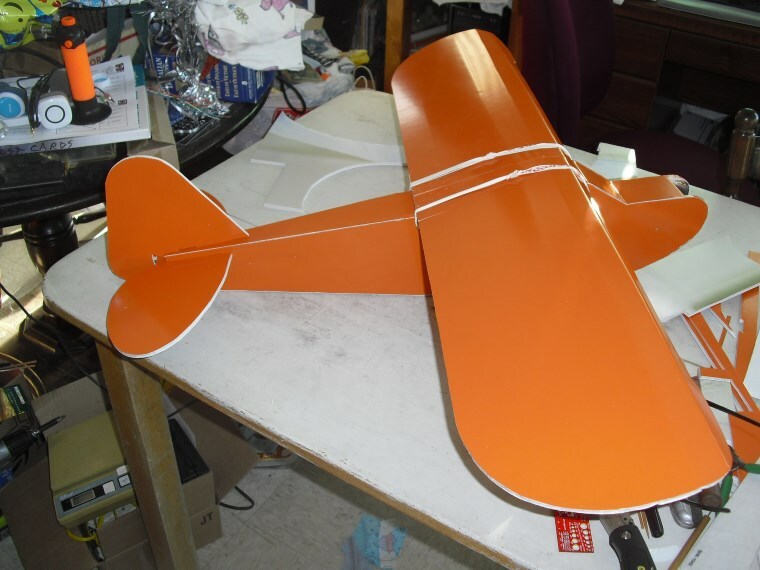 The wing without servos is 18oz (509 grams). If the Elmer's is still paper-sheeted), this probably has more structural integrity, especially where i don't peel one side (that will be a job in itself). Man, that seems a bit heavy to me. 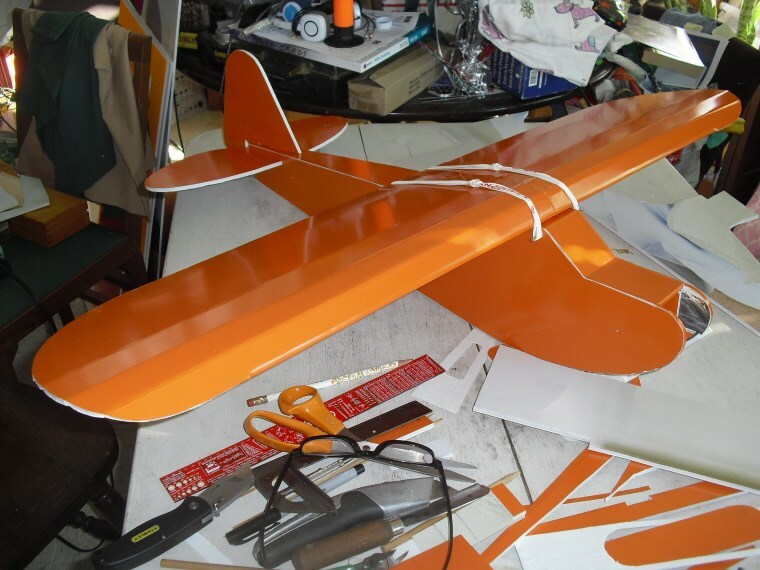 For comparison, my Storch wing has an aluminum spar in it and it's 16" wider than a standard Storch wing, for a total wingspan right around 75". That wing comes in at 24 oz with 4 servos and the RX attached. I'm not trying to be negative in the slightest, nor am I trying to discourage you, but I'm worried that your cub may be extremely overweight by the time you've finished her. The specs on the store site for that bird claim the finished weight of the entire airframe should be around 10 oz. Perhaps a design less sensitive to being overweight would make a better testbed for this material? I have firsthand experience with overweight Cubs, and long story short, they are frustrating. A wing design, like a versa for example, is much less sensitive to being heavy. I've built a couple with some monster motors out of the Elmer's stuff and they still glide extremely well, much to my surprise. Just my 2¢, best of luck to you! Well, I attempted some weight savings inside the fuselage... and got a whole ounce back. However, this little fatty is a whopping 31oz. without power pack, battery and gear. Great looking build, I love the color especially. Too bad about the weight, although it may still fly if you can get it going fast enough, lol. 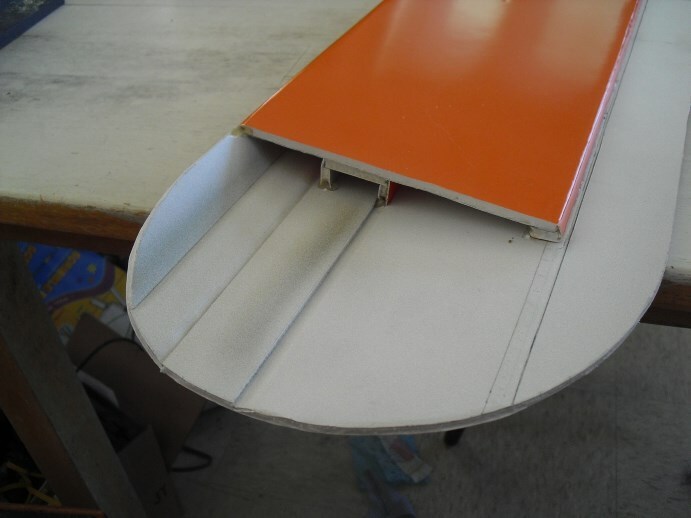 When glide testing, is it better to be a little tail heavy? I put a couple NiCd packs in the nose to balance it a little nose heavy and it dove into the ground. A little damage to the hood from one of the packs sticking up slamming into it, so I'll just cut out and replace that panel segment. Just a few minutes and "it never happened." Great looking build I too love the color . Waiting for the maiden video . That maiden will have to wait for my back-ordered power pack from FT.
BTW, does anyone have a measurement or estimation of how much thrust power pack B gives on 3s?